In honour of Halloween and all things spooky, I’ve chosen to review two very scary films, C’est Arrivé Près de Chez Vous (Man Bites Dog) & Henry: Portrait of a Serial Killer: one is Belgian, one is American; both are pseudo documentaries on serial killers (‘mockumentary’ does not seem appropriate here); both take place in small towns; both are well done technically; both are absolutely grisly; and even as both raise the question “why make a film on such morally reprehensible subject matter?” they are also original and memorable films. A group of student filmmakers make a ‘fly-on-the-wall’ documentary about a serial killer and are gradually drawn into his perverse world. The serial killer expounds on art, music, nature and society as he kills mailmen, pensioners and other random people. 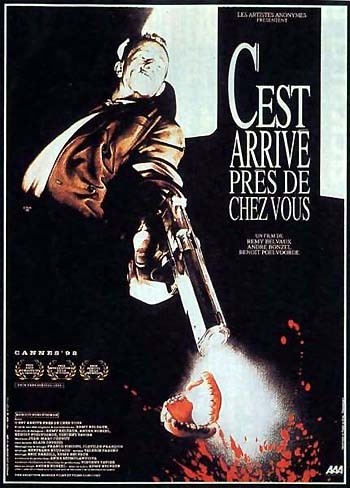 Written and Directed by Remy Belvaux, who also co-wrote the script with Angre Bonzel and Benoit Poelvoorde, this is arguably one of the most disturbing films ever made. Pitched as a documentary chronicling the exploits of a Belgian serial killer at work, rest and play in his provincial home town, the film’s grainy black-and-white photography, hand-held camerawork and messy murders make for a sick and twisted piece of work that haunts the consciousness long after you’ve finished watching the movie. While initially the film is a searing black comedy that questions the complicity of the media in its portrayal of violence, it degenerates into a numbing series of increasingly shocking scenes. This is a harrowing and uncompromising feature debut that is definitely not for the squeamish. 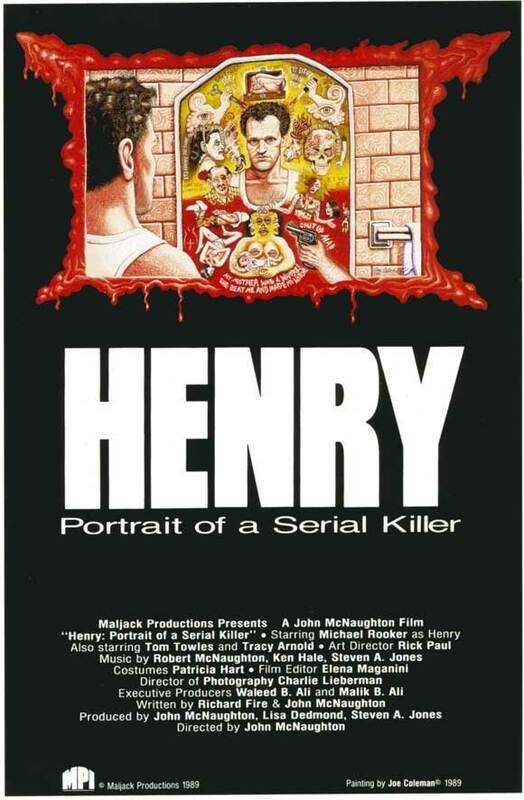 Henry, a serial killer, shares an apartment with Otis. When Otis’ sister comes to stay, both sides of Henry’s personality emerge and there are fatal consequences. Henry seems to be an ‘everyman.’ He’s also an ex-con who drifts from city to city. He’s lodging with an old prison buddy, Otis, when Otis’s sister turns up to stay and she and Henry form a close relationship. Meanwhile, Otis discovers Henry’s dark secret and becomes his willing partner in murder. The plot (though there really isn’t one, Otis and Henry simply go about their lives with detachment) development of Henry and Otis partnering up defies believability given the solitary nature of a serial killer. The film, inspired by the true case of Henry Lee Lucas who claimed to have murdered over 300 women, is truly shocking and sick. All that said, the script is spare and authentic; it’s a masterful evocation of small town low life; and the acting is performed with brilliant restraint, truth and power. I think your writing as well as your observations on “Man Bites Dog” may be your best yet. Perfect. Well done.